These and other are the questions people often ask themselves when they face the event of learning Bulgarian language. 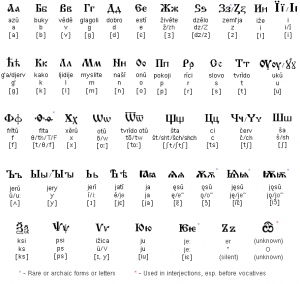 So here is this beautiful Bulgarian alphabet (Cyrillic) and there are some tips of how to get through it and understand it easier, especially for those already familiar with the Latin alphabet. Here in the 1st two lines we have letters which are similar in the way we write them and some of them in the way we pronounce them in both alphabets (as sounds). Here are these two lines which show you that sounds might be similar but letters written in a different way and especially the last ones, where we are introduced to letters with totally unfamiliar outlook (once again, speaking only about people familiar only with the Latin alphabet). If you have got interested in learning Bulgarian, here are some links where you could read a little bit more about history of the language and some interesting facts. Once memorized, letters are easy to use in writing and reading, because in more than 80% of the cases the letter represents the sound without any changes. What is the trouble then?! Well, maybe with the other, about 20% when slight changes appear. If you have already learned the alphabet and you are able to read some words, let me give you some examples. хляб (hljap) – bread (b-p) , (d-t) – voiced ones become voiceless. voiced – b, v, g, d , etc. voiceless – p, f, k, t, etc. The practical explanation is that we tend to pronounce voiceless (not so strong) consonants instead of voiced ones because it is easier and especially when we have several consonants (which is typical for Slavic languages) in one syllable (all of them together). These and some other examples in Bulgarian language are to show, as in almost every other language, that it is made not only to confuse people but to serve them because it could pretty much adjust to the way we want or would like to have it.